The Second Council of Ephesus was a church synod in 449 C.E. It was convoked by Emperor Theodosius II as an ecumenical council to deal with unresolved issues that had arisen out of the early First Council of Ephesus in 431. Because of its highly acrimonious and controversial proceedings, it was labeled by its opponents as a Robber Synod and later repudiated at the Council of Chalcedon. The council was called after the archmonk Eutyches had been deposed by Patriarch Flavian of Constantinople on account of his christological view, an early version of what later became known as Monophysitism. Eutyches appealed to Dioscorus, the successor of Patriarch Cyril of Alexandria, who restored him and influenced the emperor to summon a church synod to resolve the matter. The council of 130 bishops convened in August 449 and was dominated by Dioscorus and his followers. Eutyches was acquitted of heresy and reinstated, while Flavian and his key supporters were deposed. Opposition was met by intimidation and actual violence. The death of Flavian, which soon followed, was attributed to injuries received in this synod by his opponents. The emperor confirmed the synod, but the Eastern Church was divided on the question of accepting it. Moreover, Pope Leo I, upon hearing of the report of his delegate, the deacon and future pope Hilarius, excommunicated Dioscorus and refused to recognize the successor of Flavian. The death of Theodosius II cleared the way for the Council of Chalcedon in 451, which deposed Dioscorus and condemned Eutychianism. The Second Council of Ephesus grew out of the Nestorian controversy that had been dealt with at the First Council of Ephesus, where Cyril of Alexandria had succeeded in obtaining the condemnation of the patriarch of Constantinople, Nestorius, for his teaching on the two distinct natures of Christ, divine and human. Nestorius had been condemned especially for his refusal to accept the term theotokos (Mother of God) to describe the Virgin Mary. Although Nestorianism had thus been condemned, the underlying issue had not been resolved: Did Christ have one unified nature of divinity-humanity, or two natures, divine and human, which were harmoniously combined within a single person? Following the teaching of Cyril of Alexandria, the archmonk Eutyches had been an outspoken opponent of Nestorius. Now around 70 years of age, Eutyches had been the leader of a monastery outside the walls of Constantinople for 30 years, where he ruled over 300 monks. However, his teaching of "one nature" in Christ brought him into conflict with his bishop, Patriarch Flavian of Constantinople and several other leading churchmen in the area. In 488, Flavian presided over a council which deposed Eutyches for heresy and excommunicated both him and his monks. This synod declared it a matter of faith that after the Incarnation, Christ consisted of two natures (divine and human) united in one person, while Eutyches protested that there was only one nature (also divine and human) in Christ. Also leading in the condemnation of Eutyches were Domnus, patriarch of the Syrian city of Antioch, and Eusebius, the bishop of Dorylaeum (Phrygia). Seeing this action as as an injustice that opened the two to a revival of Nestorianism, Patriarch Dioscoros of Alexandria supported Eutyches and influenced Emperor Theodosius II to call a new ecumenical council to deal with the matter. Pope Leo I's predecessors had traditionally sided with Alexandria on theological matters. However, he now wrote to Flavian endorsing the "two natures" view, in a famous letter known as the Tome of Leo. The pope also sent legates to the council, notably the deacon Hilarius, who would later become pope himself. The acts of the first session of this synod were read at the Council of Chalcedon in 451, and have thus been preserved. Another fuller version of the council's acts is known through a Syriac translation by a Monophysite monk written in the year 535 C.E. The question before the council, by order of the emperor, was whether Patriarch Flavian, in the synod held by him at Constantinople, had justly deposed and excommunicated Archimandrite Eutyches for refusing to admit two natures in Christ. Consequently, Flavian and six other bishops who had been present at his synod, were not allowed to sit as judges at Ephesus. The emperor designated Dioscorus of Alexandria to act as president of the council. The papal legate Julius is mentioned next in order of precedence, but he seems to have been expelled at some point. Also attending was the deacon Hilarius with his notary. The number of bishops present was 198. After a message from Theodosius II was read, the Roman legates apologized for the bishop of Rome's absence by explaining that it would have been contrary to custom for the pope to attend in person. A letter from [[Leo I], indicated that he intended his dogmatic letter to Flavian to be read at the council and to be accepted as a rule of faith. However, Dioscorus refused to have it read, declaring that determining matters of dogma was not a matter for inquiry, since these had already been resolved at the earlier first Council of Ephesus, which had soundly defeated Nestorianism. The issue at hand was whether Flavian had acted properly in deposing and excommunicating Eutyches. Eutyches then was introduced. He declared that he held to the Nicene Creed, to which nothing could be added, and from which nothing could be taken away. He claimed to have been condemned by Flavian for a mere slip of the tongue and asked the council to exonerate and reinstate him. 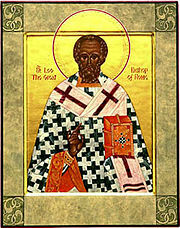 Bishop Eusebius of Dorylaeum, who was to act as the accuser of Eutyches, was not allowed to be heard. However, the bishops agreed that the acts of the condemnation of Eutyches at the synod of Constantinople in 448 should be read. At this point, the delegates of Rome publicly asked that Leo I's letter might be heard first. Eutyches argued that the papal legates could not be trusted, for they had dined with Flavian, who had treated them with great courtesy. Dioscorus decided that only the acts of the trial were germane, not the pope's doctrinal letter. The acts of Eutyches' condemnation were then read in full, and also an account of later inquiries made at Eutyches' behest alleging that these acts had been incorrectly taken down and that Flavian had drawn up the sentence against him beforehand. During these proceedings, acrimonious shouts were heard against Flavian's "Nestorianism," and Flavian rose to complain that no opportunity was given him to defend himself. The bishops proceeded to cast 114 votes absolving Eutyches, with each bishop making a short speech in the process. A petition was read from the monastery of Eutyches, which had been excommunicated by Flavian. The synod absolved them also, and reinstated the monastery to communion. Dioscorus then led the bishops in deposing Flavian from his post, and 135 bishops ultimately joined in signing the canon removing him. The Syriac acts take up the history where the Chalcedonian version breaks off. In the next session, 113 were present, with several bishops apparently having left and nine new names being listed. The Roman delegates did not appear, apparently having left after the council's disregard of the pope's letter. The council now dealt with the case of Ibas, Bishop of Edessa, who had been acquitted of charges of Nestorianism in February. However, after a new inquiry in April, the emperor ordered that a another bishop should be chosen to replace him. The council convicted Ibas and sentenced him to deposition and excommunication. Ibas' teaching would later become one of the issues in the Three Chapters controversy. The council also ratified the deposition a certain Bishop Irenaeus of Tyre as a bigamist and a blasphemer. Aquilinus, Bishop of Byblus, who had been consecrated by Irenaeus, was also deposed. Theodoret, who had been an opponent of Dioscorus and a friend of Nestorius, was also deposed and excommunicated, despite having earlier reached accord with Cyril of Alexandria. Like Ibas, he too would became an issue during the The Chapters controversy and the Second Council of Constantinople. Bishop Domnus of Antioch was said to have agreed in the first session to the acquittal of Eutyches but did not appear at the latter sessions of the council, pleading illness. He was now accused of friendship with Theodoret and Flavian, of Nestorianism, of altering the form of the sacrament of baptism, and of being an enemy of the holy Dioscorus. The council's final act was to depose him. Flavian was deported into exile and died a few days later in Lydia, with the council's opponents alleging that he in fact died of wounds received at this "Robber Synod." The council reported its acts to the emperor, who confirmed its legitimacy with his own letter. Dioscorus sent an encyclical to the bishops of the East, with a form which they were to sign and return, indicating their agreement with its acts. He then went to Constantinople and appointed his secretary, Anatolius, as bishop of that see. On his way back to Egypt, Dioscorus stopped at Nicaea, where, in a council with ten other bishops, he excommunicated the Pope Leo I. Meanwhile Leo I himself had received appeals from Theodoret and Flavian, of whose death he was unaware. He wrote to them, and to the emperor and empress, declaring that the acts of the council were null and void. He eventually excommunicated all who had supported it and absolved those it had condemned. 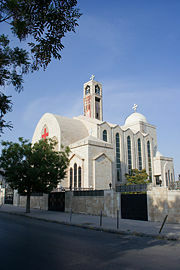 A Coptic Orthodox church in Jordan. Evidence given at the Council of Chalcedon strongly impugned the conduct of the Second Council of Ephesus. It stated that the secretaries of the bishops had been violently prevented from taking notes and declared that Dioscorus and others had even struck Flavian. Police and soldiers had to be called in during the ensuing scene of violence. Some of the bishops allegedly endorsed the synod's acts under intimidation, and others did not sign at all, their names being added afterward. The papal legate Hilarius was said to have bravely uttered a single word in Latin, Contradicitur, purportedly annulling the council's sentence in Leo I's name. He then escaped with difficulty and secretly made his way back to Rome, leading to Leo's officially nullifying the council's acts. The tide had now turned away from the persecution of Nestorianism and toward the condemnation of its opposite, namely Monophysitism. At the Council of Chalcedon, held in 451 after Theodosius II's death, Euthyches would again be condemned as a heretic. Even Dioscorus, who was deposed at Chalcedon, joined in anathematizing Eutyches shortly after the council's conclusion. 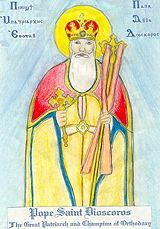 Although considered a Monophysite himself by many, Dioscorus is honored as a a great saint in the modern Coptic, Syriac, and other Oriental Orthodox churches. al-Masri, Iris Habib. An Intrepid Confessor: Dioscorus I, 25th Pope of Alexandria, 444-458. Leeds: Leeds University Oriental Society, 1967. OCLC 9243408. Davis, Leo Donald. The First Seven Ecumenical Councils (325-787): Their History and Theology. Theology and life series, v. 21. Collegeville, MN: Liturgical Press, 1990. ISBN 9780814656167. Gambero, Luigi. Mary and the Fathers of the Church: The Blessed Virgin Mary in Patristic Thought. San Francisco: Ignatius Press, 1999. ISBN 9780898706864. Wessel, Susan. Leo the Great and the Spiritual Rebuilding of a Universal Rome. Supplements to Vigiliae Christianae, v. 93. Leiden: Brill, 2008. ISBN 9789004170520. History of "Second Council of Ephesus"
This page was last modified on 26 August 2015, at 16:18.